NEW YORK – The outcome of the Italian elections should send a clear message to Europe’s leaders: the austerity policies that they have pursued are being rejected by voters. The European project, as idealistic as it was, was always a top-down endeavor. But it is another matter altogether to encourage technocrats to run countries, seemingly circumventing democratic processes, and foist upon them policies that lead to widespread public misery. While Europe’s leaders shy away from the word, the reality is that much of the European Union is in depression. The loss of output in Italy since the beginning of the crisis is as great as it was in the 1930’s. Greece’s youth unemployment rate now exceeds 60%, and Spain’s is above 50%. With the destruction of human capital, Europe’s social fabric is tearing, and its future is being thrown into jeopardy. The economy’s doctors say that the patient must stay the course. Political leaders who suggest otherwise are labeled as populists. The reality, though, is that the cure is not working, and there is no hope that it will – that is, without being worse than the disease. Indeed, it will take a decade or more to recover the losses incurred in this austerity process. In short, it is neither populism nor shortsightedness that has led citizens to reject the policies that have been imposed on them. It is an understanding that these policies are deeply misguided. Europe’s talents and resources – its physical, human, and natural capital – are the same today as they were before the crisis began. The problem is that the prescriptions being imposed are leading to massive underutilization of these resources. Whatever Europe’s problem, a response that entails waste on this scale cannot be the solution. The simplistic diagnosis of Europe’s woes – that the crisis countries were living beyond their means – is clearly at least partly wrong. Spain and Ireland had fiscal surpluses and low debt/GDP ratios before the crisis. If Greece were the only problem, Europe could have handled it easily. An alternative set of well-discussed policies could work. Europe needs greater fiscal federalism, not just centralized oversight of national budgets. To be sure, Europe may not need the two-to-one ratio of federal to state spending found in the United States; but it clearly needs far more European-level expenditure, unlike the current miniscule EU budget (whittled down further by austerity advocates). A banking union, too, is needed. But it needs to be a real union, with common deposit insurance and common resolution procedures, as well as common supervision. There will also have to be Eurobonds, or an equivalent instrument. European leaders recognize that, without growth, debt burdens will continue to grow, and that austerity by itself is an anti-growth strategy. Yet years have gone by, and no growth strategy is on the table, though its components are well known: policies that address Europe’s internal imbalances and Germany’s huge external surplus, which now is on par with China’s (and more than twice as high relative to GDP). Concretely, that means wage increases in Germany and industrial policies that promote exports and productivity in Europe’s peripheral economies. What will not work, at least for most eurozone countries, is internal devaluation – that is, forcing down wages and prices – as this would increase the debt burden for households, firms, and governments (which overwhelmingly hold euro-denominated debts). And, with adjustments in different sectors occurring at different speeds, deflation would fuel massive distortions in the economy. If internal devaluation were the solution, the gold standard would not have been a problem in the Great Depression. Internal devaluation, combined with austerity and the single-market principle (which facilitates capital flight and the hemorrhaging of banking systems) is a toxic combination. The European project was, and is, a great political idea. It has the potential to promote both prosperity and peace. But, rather than enhancing solidarity within Europe, it is sowing seeds of discord within and between countries. Europe’s leaders repeatedly vow to do everything necessary to save the euro. European Central Bank President Mario Draghi’s promise to do “whatever it takes” has succeeded in providing a temporary calm. But Germany has consistently rejected every policy that would provide a long-term solution. The Germans, it seems, will do everything except what is needed. Of course, the Germans have reluctantly come to accept the necessity of a banking union that includes common deposit insurance. But the pace with which they accede to such reforms is out of kilter with the markets. Banking systems in several countries are already on life support. How many more will be in intensive care before a banking union becomes a reality? Yes, Europe needs structural reform, as austerity advocates insist. But it is structural reform of the eurozone’s institutional arrangements, not reforms within individual countries, that will have the greatest impact. Unless Europe is willing to make those reforms, it may have to let the euro die to save itself. The EU’s Economic and Monetary Union was a means to an end, not an end in itself. The European electorate seems to have recognized that, under current arrangements, the euro is undermining the very purposes for which it was supposedly created. That is the simple truth that Europe’s leaders have yet to grasp. Joseph E. Stiglitz, a Nobel laureate in economics and University Professor at Columbia University, was Chairman of President Bill Clinton’s Council of Economic Advisers and served as Senior Vice President and Chief Economist of the World Bank. His most recent book is The Price of Inequality: How Today’s Divided Society Endangers our Future. Today's low interest rates are a rare opportunity to buy time for a fiscal housecleaning. Sooner or later, the Federal Reserve will want to raise interest rates. Maybe next year. Maybe when unemployment declines below 6.5%. Maybe when inflation creeps up to 3%. But it will happen. Can the Fed tighten without shedding much of the record $3 trillion of Treasury bonds and mortgage-backed securities on its balance sheet, and soaking up $2 trillion of excess reserves? Yes. The Fed can easily raise short-term interest rates by changing the rate it pays banks on reserves and the discount rate at which it lends. But this comforting thought leaves out a vital consideration: Monetary policy depends on fiscal policy in an era of large debts and deficits. Suppose that the Fed raises interest rates to 5% over the next few years. This is a reversion to normal, not a big tightening. Yet with $18 trillion of debt outstanding, the federal government will have to pay $900 billion more in annual interest. Will Congress and the public really agree to spend $900 billion a year for monetary tightening? Or will Congress simply command the Fed to keep down interest payments, as it did after World War II, reasoning that "Fed independence" isn't worth that huge sum of money? This additional expenditure would double the deficit, which tempts a tipping point. Bond markets can accept fairly big temporary deficits without charging higher interest rates—buyers understand that bigger deficits for a few years can be made up by slightly larger tax revenues or spending cuts over decades to follow. But once markets sense that deficits may be unsustainable, and that bond buyers may face default, restructuring or inflation, they will demand still-higher interest rates. Higher rates mean higher deficits—leading to a fiscal death spiral. Many economists think the tipping point starts when total government debt (federal, state and local) exceeds 90% of GDP. We are past that value, with large state and local debts, continuing sclerotic growth and a looming entitlements crisis to boot. This, not the "balance sheet" or other monetary or institutional constraints, will be the Fed's quandary—can the monetary authority really dare to risk a fiscal crisis? The obvious answer is to fix the long-run deficit problem, with the reform of runaway spending, entitlement programs and a pro-growth tax policy. So far that is not happening. Still, the Fed and the Treasury can buy a lot of time by lengthening the maturity of U.S. debt. Suppose all U.S. debt were converted to 30-year bonds. Then, if interest rates rose, Treasury would pay no more on its outstanding debt for 30 years. And if the country couldn't solve its fiscal problems by that time, it would deserve a Greek crisis. Alas, the maturity structure of U.S. debt is quite short. I estimate that our government rolls over 40% of its debt every year, and 65% within three years. (I account for Federal Reserve holdings, coupon payments and use market values.) Thus the fiscal impact of higher interest rates will come quickly. Mr. and Mrs. Smith shopping for a mortgage understand this trade-off. Mr. Smith: "Let's get the adjustable rate, we only have to pay 1%." Mrs. Smith: "No, honey, that is just the teaser rate. If we get the 30-year fixed at 3%, then we won't get kicked out of the house if rates go up." Amazingly, nobody in the federal government is thinking about this trade-off. Instead, each agency thinks only for itself. The Fed is still buying long-term bonds in an effort to temporarily drive down long-term interest rates by a few basis points. It has concluded it can survive the loss in mark-to-market value of its bond portfolio that higher interest rates will imply, when they come, by suspending its customary interest-rebate payments to the Treasury. If the Treasury was counting on that roughly $80 billion per year, that is Treasury's problem. If higher rates cost the Treasury $900 billion a year, that is Congress's problem. 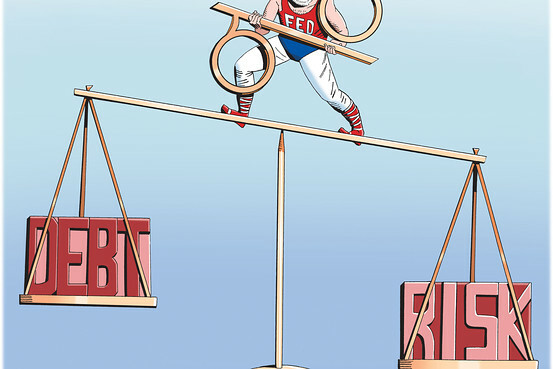 The Treasury's Bureau of Public Debt controls the maturity of federal debt issues. It has been gently borrowing longer in response to low long-term rates, but not enough to substantially alter the government's interest-rate risk. The bureau also views its job narrowly—which is to finance whatever deficits Congress determines, not to take actions that mitigate future deficits. Congress and the administration are busy with other matters. Ironically, the Fed's buying and the Treasury bureau's selling have neatly offset, leaving very little change in the maturity structure of debt in private hands. What to do? First, the Treasury and Fed need a new "accord" to decide who is in charge of interest-rate risk, most likely the Treasury, and then grant it clear legal authority to manage that risk. The Fed should then swap its portfolio of long-term bonds for a portfolio of short-term Treasuries and forswear meddling in the maturity structure again. Second, the Treasury should seize its once-in-a lifetime opportunity to go long. Thirty-year interest rates are at 2.8%, a 60-year low. Many corporations and homeowners are borrowing long to lock in low funding costs. So should the Treasury. You may complain that if the Treasury borrows long, then long-term rates will rise. If so, it is better that everyone knows that now. It means that markets aren't really willing to buy long-term government debt, that the 2.8% yield is only a fiction of the Fed's current buying, and that it won't last long anyway. Better fix the fiscal hole, fast. You also may argue that 2.8% long term-debt is more expensive than 0.16% one-year debt. There are two fallacies here. First, the 2.8% long-term yield reflects an expectation that short rates will rise in the future, so the expected cost over 30 years, as well as the true annual cost, are much closer to the same. Second, to the extent that long-term bonds really do pay more interest over their life span, this is the premium for insurance. Sure, running a restaurant is cheaper if you don't pay fire insurance. Until there is a fire. A much longer maturity structure for government debt will buy a lot of insurance at a very low premium. It will buy the Fed control over monetary policy and preserve its independence. If Fed officials realized the risks, they would be screaming for longer maturities now. But we don't have long to act. All forecasts say long-term rates will rise soon. As the car dealer says, this is a great deal, but only for today. Mr. Cochrane is a professor of finance at the University of Chicago Booth School of Business, a senior fellow of the Hoover Institution and adjunct scholar of the Cato Institute. WASHINGTON, DC – The developing world is experiencing rapid urbanization, with the number of city dwellers set to reach four billion in 2030 – double its 2000 level. But unplanned and uncoordinated urban development is risky, threatening to replace migrants’ hopes for a better life with unsanitary living conditions, joblessness, and high exposure to natural disasters. In many respects, urbanization is rational. After all, cities are the hubs of prosperity, where more than 80% of global economic activity is concentrated. And their density facilitates the delivery of public services, including education, health care, and basic services. Indeed, it costs $0.70-0.80 per cubic meter to provide piped water in urban areas, compared to $2 in sparsely populated areas. But the high concentration of assets and people, especially in coastal areas, is an economic liability, with around $3 trillion in assets at risk from natural hazards. Vulnerability will increase further over the next two decades, as cities triple their built-up land, to 600,000 square kilometers, often without basic infrastructure or policies to prevent construction and settlement on disaster-prone and vulnerable sites. To get urbanization right, policymakers must take urgent action to build sustainable cities. Through effective land-use management, they can provide reliable and affordable access to basic services, education, housing, transport, and health care to growing urban populations, while minimizing the carbon footprint. This entails, first and foremost, abandoning the perception of a tradeoff between “building more cities” to accommodate rapid urban growth and “building cities right” to enhance social and environmental outcomes. In fact, evidence shows that building cities right generates near-term benefits, while reducing the longer-term costs associated with sprawl, congestion, pollution, and climate change. The alternative – building cities around a low-density, individual-vehicle transportation model – will leave urban planners struggling to increase density and develop public-transport systems later, a challenge that the United States is currently facing. A new World Bank report provides a practical agenda for building sustainable cities. The framework – which emerged from a three-year effort to develop a foundation of credible facts and analysis from countries with diverse urban experiences, such as Uganda, China, India, and South Korea – can help policymakers to understand the obstacles to urbanization and to identify politically, technically, and fiscally feasible policy options. This framework reflects three main aspects of urban development: planning, connecting, and financing. A major finding is that, regardless of the level or speed of urbanization, planning for land-use management should be the top priority. By clearly defining property rights and implementing effective land-use systems that are coordinated with infrastructure, particularly transport, policymakers can help cities to attract private investment, connect people with jobs, reduce environmental and social risks, and decrease vulnerability to natural hazards. With urban growth in developing countries likely to occur largely in secondary cities, the opportunity is still open (but closing fast) to shape urban design to ensure that, for example, residents do not spend half of each day commuting to and from work. While no single model for managing rapid urbanization exists, positive examples offer some guidance. For example, Seoul’s population more than tripled from 1960 to 2000. South Korean policymakers, anticipating the challenges, strengthened institutions for valuing and pricing land, trained a cadre of appraisers to ensure transparency in the valuation process, and publicly disseminated land-value information. At the same time, the government supported construction of high-rise residential buildings capable of housing the growing urban population and developed multiple transport modes, including highways, rail networks, and subway lines, which have helped to connect people with employment opportunities within and among cities. Likewise, leaders in Singapore and Japan treated public transport as a crucial aspect of land-use plans. As a result, they boast some of the world’s lowest energy consumption as a share of GDP. In order to encourage citizens to use public transport, policymakers in Tokyo reduced subsidies for private cars, so that driving one became five times costlier than using public transport. Complementary investment in high-speed inter-city transport has reduced travel times between Japan’s two largest agglomerations, Tokyo and Osaka, which are 314 miles apart, to less than two and a half hours, thus integrating labor and housing markets and enhancing productivity. Of course, financing rapid urban development requires significant capital outlays to build efficient systems for transport, water provision, solid waste management, and sewage removal and treatment. But, as these investments bolster economic growth, increased tax revenues would imply more sustainable financing, as would local governments’ ability to leverage land markets and approach local-currency debt markets. In Mumbai, the auction of 13 hectares of land in the new financial center, the Bandra-Kurla Complex, generated $1.2 billion. This amounts to more than ten times the Mumbai Metropolitan Region Development Authority’s total expenditure in 2005, and six times the total value of municipal bonds issued by all local governments and utilities in India in more than a decade. Similarly, in Istanbul, the auction of an old bus station and government building in 2007 generated $1.5 billion – more than the city’s total expenditures and infrastructure investments in 2005. And Colombia’s finance ministry has developed Findeter, a bond bank that finances regional urban infrastructure projects by providing resources to financial intermediaries that allocate them to subnational authorities. By building sustainable cities, policymakers can support social and economic development, while minimizing environmental damage. Managing urbanization as it occurs, rather than struggling to fix cities later, is an opportunity that developing-country leaders should not miss. Zoubida Allaoua is Director of the World Bank’s Urban and Disaster Risk Management Department. Mahmoud Mohieldin is Managing Director at the World Bank Group, and was formerly Egypt’s minister for investment. Politicians, bankers and business leaders in the west often look at China’s system of market leninism with a touch of envy. How far-sighted China’s leaders are with their five-, 10- and even 20-year plans. How efficient the system is without the hindrance of popular elections or pesky concerns over individual liberties. Many of these admirers may expect visionary policies to be unveiled at China’s annual parliamentary session, which opens on Tuesday and will formally anoint Xi Jinping as president for the next decade by the time it closes on March 17. But apart from some tinkering around the edges and a bureaucratic reshuffle of ministries, the session is likely to disappoint anyone who hopes for serious root and branch reform of China’s current political or economic structure. Mr Xi is the powerful son of a Communist guerilla commander who also served at the top of the Chinese government. Perhaps the best way for FT readers to think of him is as the newly appointed chief executive of an enormous conglomerate who has worked for the company his whole life and whose father was a founding shareholder and lifelong senior executive. Success in his new role depends to a large degree on the support of upper and middle management, many of whom he has known since he was a young recruit. He will also have to contend with a shadowy board of directors made up of senior and retired civilian and military officials and their families who retain veto rights over major policy initiatives even after they have left the political stage. There is not a scrap of evidence that Mr Xi harbours a secret desire to radically overhaul the current Chinese system and that is one big reason why he got this job in the first place. But even if he was somehow planning to introduce major reforms, the chances are slim that he would be able to vanquish any of the huge array of vested interests that oppose change in almost every sphere. Since taking over as head of the Communist party and head of the military in November, Mr Xi has done a masterful job of playing to his various constituents. He has talked tough for the nationalists. He has talked about constitutionalism for the liberals. He has talked up private enterprise and the revival of the decrepit welfare state. And he has launched a hugely popular but so far superficial anti-corruption campaign. But what he has also done is raise expectations of reform in China far beyond what he and his new administration will be able to deliver and that is likely to backfire in the end. All across the Chinese political spectrum people are projecting their hopes and dreams onto him but the reality is that power in China is much less concentrated than it was in the days of Mao and Deng. Far from being the all-powerful behemoth that some in the west admire for its omnipotence, the central government can often be oddly ineffectual and powerless. A slightly frivolous but nonetheless instructive example is the government’s complete ban on the construction of golf courses that has been in place since 2004. Since then the number of golf courses in China has nearly quadrupled. The point is that Beijing produces many well-intentioned laws and regulations that are often not implemented or enforced unless they directly align with the interests of cadres at the lower levels of state power. The central government can impose its will and mobilise the nation when it absolutely has to but it uses up an enormous chunk of political capital every time it does that. Because of this, China’s leaders tend to spend a lot of time giving positive speeches but they only really swing into action when faced with a serious crisis. A good example was the Sars epidemic that emerged from southern China almost exactly 10 years ago and presented the now outgoing administration of Hu Jintao and Wen Jiabao with their first big test at the outset of their time in office. After trying first to cover it up they finally responded by mobilising the entire country and eventually brought the disease under control. Mr Xi and his team have not yet been tested with their equivalent of a Sars moment but when they are it will provide more of an insight into their ability to govern the world’s most populous nation than the next two weeks of political pageantry in Beijing.